High Noon is a multiplayer map included in Halo: Combat Evolved Anniversary for Halo: Reach. It is the remake of Hang 'Em High from Halo: Combat Evolved. 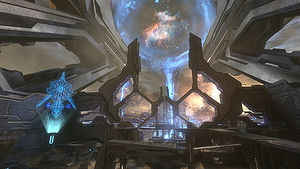 The map is set in a massive Forerunner generator complex which powers an enormous slipspace portal, connected with an unknown number of locations across the galaxy. Passage through this system requires a Forerunner keyship. The playable area itself is an observation platform, barely sheltered from a storm raging just outside, creating a whirlwind of dust and debris around the center of the portal. Part of the structures in the playable space is also partially covered in sand. The map's name references the 1952 western film High Noon. Hang 'em High itself also references to another western film called Hang 'em High which was released in 1968. According to 343 Industries, the map's setting and aesthetic went through a number of iterations before the decision to use a Forerunner theme. For the map, Certain Affinity and 343 Industries' Franchise team did a significant amount of exploration on the architecture and mechanics of Forerunner technology. According to gameplay footage found on YouTube and 343's website, it appears that the red base and blue base have been switched. It is to be noted that while on Forge, the cubic Forerunner objects seemingly planted in the ground are known as "tombstones", meaning that there is a possibility that this is a Forerunner burial ground. Alternatively, it might be a reference to the Halo 2 remake of Hang 'em High, Tombstone, or the description of the original Hang 'em High, which read "tombstones for everyone". Environmental concept art of High Noon. All-around view of High Noon. A corridor on High Noon. A trench on High Noon. Support structure on High Noon. Bridge structure on High Noon. Multiple smaller structures on High Noon. A slipspace portal generator on High Noon, on an unknown world. A slipspace portal as seen from the Forerunner observation station on High Noon.